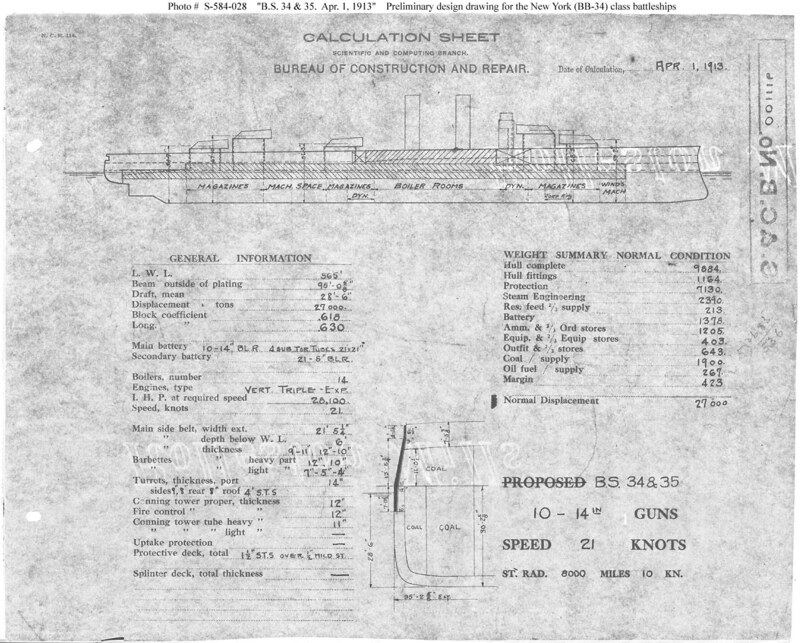 Preliminary design plan presenting the features adopted for Battleships Nos.34 and 35, which became New York and Texas, respectively. The original drawing has the word "proposed" crossed out, indicating that this plan reflected the design selected for preparation of detailed construction drawings. Battleship No.34 underwent preliminary design during the first half of 1910, with the preparation of contract plans underway by July of that year. Accordingly, this drawing probably was prepared for use in comparison with new designs under consideration later. 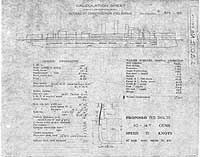 This plan, dated 1 April 1913, provides ten 14-inch guns, reciprocating machinery, and a speed of 21 knots in a ship 565 feet long on the waterline, 95 feet 0-5/8 inches in beam, and with a normal displacement of 27,000 tons.